Carrying placards and chanting “Cure SMA” and “Spinraza for all,” a group of health care activists descended on Parliament Hill Tuesday to urge the federal government to help fund an expensive treatment for a rare neuromuscular disorder. Spinal muscular atrophy, or SMA, is a genetic disease that severely affects mobility in children and often leads to paralysis and early death. Affecting all muscles in the body, it impacts everything from walking to swallowing and dramatically worsens over time. Incredibly rare, roughly one in 6,000 babies is born with SMA. The best known treatment for SMA is a drug called nusinersen, which is marketed under the name Spinraza. But while the drug was approved for use by Health Canada in 2017, it is still not fully covered by any provincial healthcare plan. Spinraza is also one of the most expensive drugs in the world. The annual cost the drug in Canada is $708,000 for the first year of treatment, and $354,000 every year after for the rest of a patient’s life. Partially due to that astronomical cost, a December, 2017, report from the Canadian Agency for Drugs and Technologies in Health - CADTH -- a not-for-profit that provides “health care decision-makers with objective evidence to help make informed decisions about the optimal use of health technologies” -- recommended that only SMA patients seven monthsold and younger with the most severe form of the disease should be reimbursed by government health care programs for Spinraza treatment. Cure SMA Canada organized Tuesday’s demonstration. Many of the activists who came to Ottawa say the drug, which is injected directly into the spine to regenerate a protein missing in those who have SMA, is incredibly effective. In December, and after months of wrangling, Eddie Stewart was finally able to get his private health insurance provider to cover the medication for his son, Mason. Mason, however, is lucky: many private insurance companies consistently argue that coverage of the medication should come from the government. Biogen, the American maker of the drug, has also not brought the price of the Spinraza down since it first hit the U.S. market in late 2016. Sammy Cavallaro, 17, and his family travelled from their home in Kirkland, Quebec -- a Montreal suburb -- on Tuesday to join the demonstration. 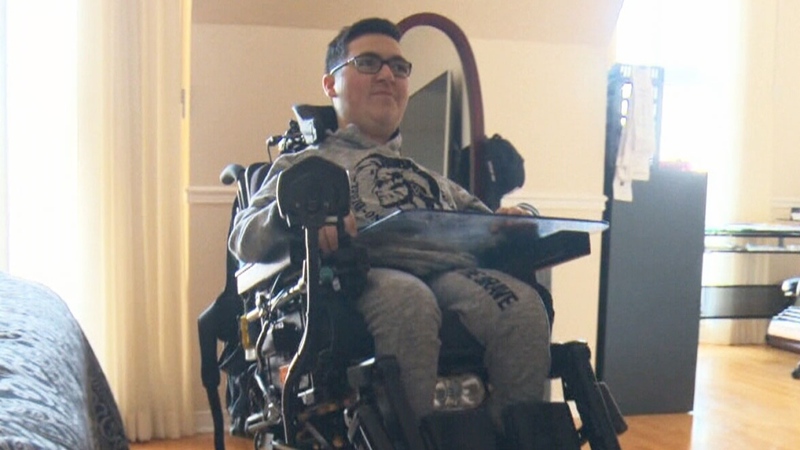 Living with SMA, the teen uses a motorized wheelchair to get around and requires assistance to even do simple tasks like eating. Still, told that he would not live past being a toddler, he is defying the odds while hoping to receive the drug too. “We have to find a happy medium somewhere,” his mother Rosa Cavallaro added. Sammy’s father, Aniello Cavallaro, is eager for the government to fund Spinraza injections for his son. "The results that they've done with the research, it's all positive,” he said. “There have been no bad side effects. There are young babies that had SMA when they were born and now they're walking."